SERVICES: TV, WI-FI, AUTO PARKING, BYCICLE PARKING AND BYCICLE WASHING FREE. HORSEBACK RIDING. BREAKFAST CHOICE OF : Cappuccino, hot chocolate, express coffee, decafinated coffee, tea : twinings, green, fruit, malloio, lime & mint. Croissant, biscuits, chocolate or jam tarts, muffins, yogurt. cereals, butter, honey, fruit juice, nutella and jams. Its fortunate location permits a different itinerary every day from places of interest or relax never allowing time for boredam. For athletics mountain bike excursions at various levels are organised by the local cyclying club close by many stables offer facilities for riding. Approx 8 Km away is Cerveteri, famous for the Etruscan Necropolis and good wine! For lovers of health and beauty the Stigliano Thermal Baths surely help to regenerate body and mind while surrounded by beautiful valleys and landscapes. The Summer invites you to Fregene attracted by tourists and vips for its well organised exclusive beaches. 6 km away is Ladispoli, another sea town well known for its rare black sand beaches and when in April bursts with enthusiasm for the artichoke fete, a typical local product. Attached to Ladispoli is Marina di San Nicola, a small Holiday Town much more tranquil but chic. 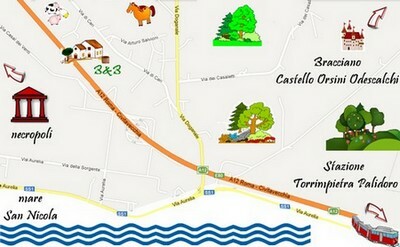 Bed & Breakfast "Al vecchio fontanile"